Throwing out the form book? So it's been quite a while since I posted anything here, but with the thrill of a new English cricket season upon me, I'm strapping on my pads of data, taking up my bat of analysis and striding out to the wicket of the internet. As I scratch around, hoping to hit a bit of early season form, I'm going to attempt some rudimentary analysis of exactly that concept- "form". The point of this blog is meant to be try and hold up some of cricket's hoariest old cliches and nuggets of received wisdom to the light of some data. The idea of being "in form" is surely one of the foremost such cliches in cricket- perhaps in all of sport. The eseential claim is this: a player is more likely to perform well at times when they have performed well in the recent past. A player who has performed well recently is usually said to be "in form". The explanations for this tend to hinge on a player's confidence being high when their recent performances have been good. Or people may speak about players "being in a good rhythm", or "in a good place". "when you're in good form, it's amazing how the little bits of luck start going your way as well- playing and missing rather than nicking it, balls in the air going between fielders rather than to them..."
At which I might want to say to them: "Is it amazing? Is it though? Or is it just that you only assign players the property of "good form" when they happen to be on a good run of scores- which requires a certain amount of luck?". I'm not going to attempt a full analysis of whether form is a "real" phenomenon- in the sense of being meaningfully predictive of future performance- in one blog post. Although I may come back to different aspects of the question later. I do, however, have some data to show which impacts on this question and I think it's interesting. To make the question narrower, and therefore more tractable, I asked: "are test match batsmen more likely to score a century when they have already scored a test century in the last month?" To answer this, I looked at the careers of the 23 most prolific test match century scorers in history. I did this because I needed a sample of players who had scored enough centuries that one could meaningfully compare the games when they hadn't scored one recently, with games where they had. Obviously, this does introduce quite a big selection bias- it's possible that the results I obtain may only be applicable to those players at the very top of cricketing history's tree. So be aware of that when you decide what to think of the results. 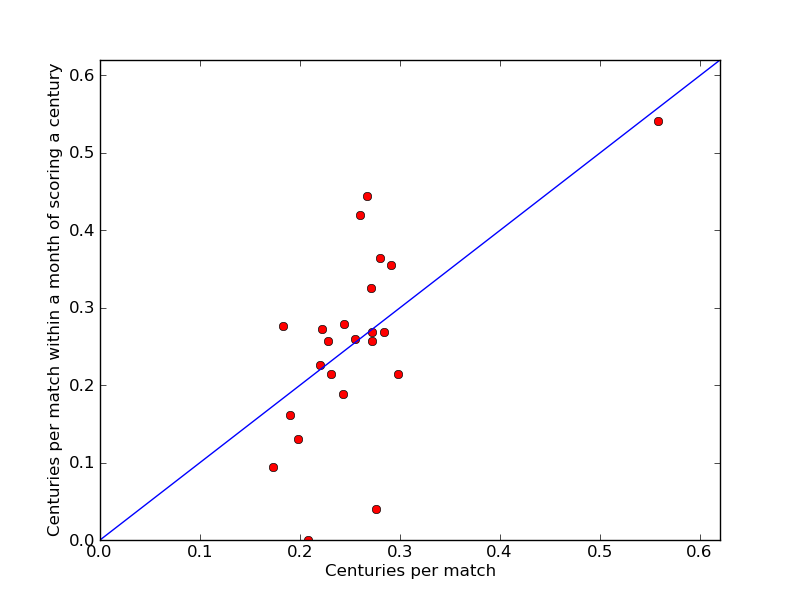 The graph below shows the rate of century scoring per match in games within a month of having previously scored a century against the total number of centuries scored per match for each player. Points above the blue line represent players who had a higher rate of century scoring when they had recently scored a century and those below the blue line represent players who had a lower rate of century scoring when they had recently scored a century. The lone point way off to the top right of the graph is, of course, Sir Donald Bradman. As a group these batsmen scored an overall total of 723 centuries in 2945 games- a rate of 0.246 centuries per match. 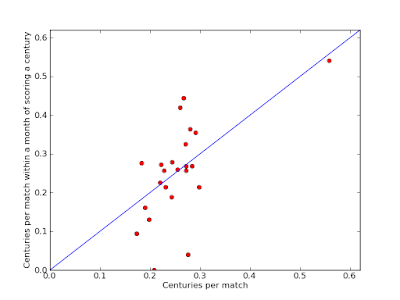 In games within a month of having scored a test century my research puts them at a total of 182 centuries in 704 games- for a nearly identical (but slightly higher) rate of 0.258 centuries per match. On an individual level 11 of the players were more prolific when they'd recently hit a hundred and 12 were less so. For most players the difference was minor, as indicated by the fact that most points in the graph fall fairly close to the blue line. There isn't enough evidence here for me to boldly claim that form makes no difference to batsmen. But it does suggest that form doesn't matter as much as you might imagine, at least for this sample of batsmen who belong among history's greatest. For those out of form I would say this: take heart- form is an ephemeral thing which can return as suddenly as it departs. And maybe it doesn't matter so much whether you have it or not.